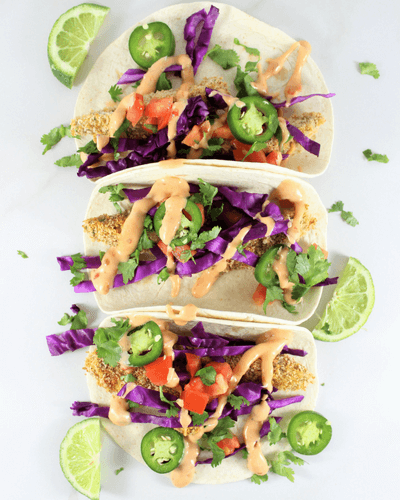 Baked Avocado Tacos with Boom Boom Sauce with a pinch of spice, nice crunch and an addicting sauce on top. We love tacos in this household. Could literally eat them every single say of the week. No problem. You have to switch things up a bit every once in awhile though! Today we made these Baked Avocado Tacos with Boom Boom Sauce. I wanted something vegetarian but still colorful and flavorful. We are a meat eating family. Dinner pretty much always revolves around the meat. A steak, chicken, pork, turkey or what have you. With that said, it can be so difficult to feed my family anything vegan or vegetarian. They literally will look at me like I am an alien if meat is not on the dinner table. Everyone ate these without complaints. My son didn’t even realize he was eating baked avocado until he asked half way through taco number 2. 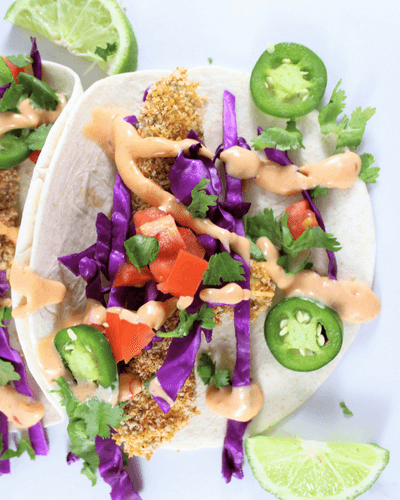 Baked Avocado Tacos with Boom Boom Sauce are fairly simple to make and use basic ingredients. 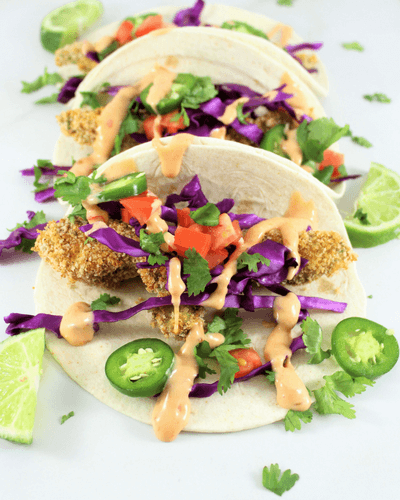 The only “difficult” part of preparing these tacos are handling the avocado slices as you give them that crunchy panko. Make sure your avocados are not too squishy because it will make your job a little bit harder. We spiced up the panko mixture just slightly to add more flavor and kick. Feel free to double the amount of cayenne spice in the panko if you like the extra heat in your food! I went ahead with a boom boom sauce today. Simple. Delicious. Takes 5 seconds to prepare. Perfect. Boom boom sauce is fantastic with fried or crusted fish, chicken, or a French fry dip. If you love fish and haven’t had a fried cod sandwich with boom boom sauce, I recommend it. 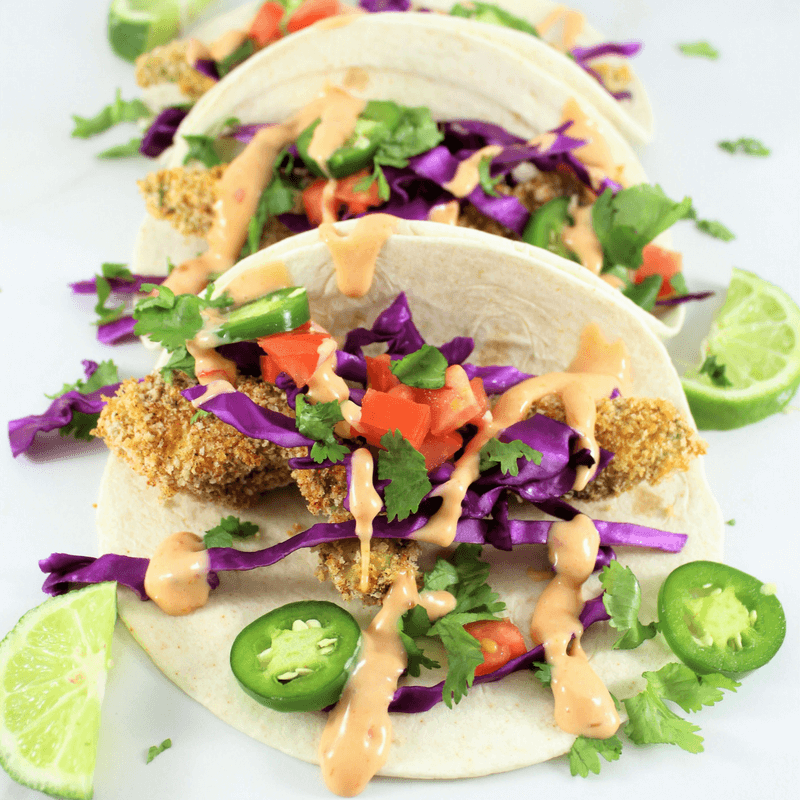 Baked Avocado Tacos with Boom Boom Sauce on Tuesday, Crispy Baked Cod Sandwich with boom boom sauce on Wednesday. It’s a plan. Who’s with me? Gather ingredients, measuring cups, 4 bowls, parchment paper, baking sheet, whisk, knife and cutting board. Grab your patience too. Wash all fruits and vegetables well, especially the cilantro because it tends to hold in a lot of dirt. Set up 3 bowls. Bowl #1 with the flour. Bowl #2 with 2 eggs that were beaten with the whisk well. Bowl #3 mix 1 cup panko, 1 teaspoon cayenne, 1 teaspoon garlic powder, pinch of salt and pepper. Set bowls up in order of 1-2-3. Take 2 avocados and cut in half, remove the seeds. Now, slice each half 3 times to make 4 pieces per half of avocado. Remove from the skin with a spoon. Now, the tedious part. One avocado slice at a time go through each bowl 1-2-3. Cover in flour bowl, then the eggs and lastly the panko mixture. This step of the process is not hard nor does it take any cooking talent but the avocado can get messy. If you do one slice at a time though and wash hands when the flour and panko starts sticking, you will do just fine. Just takes some time. 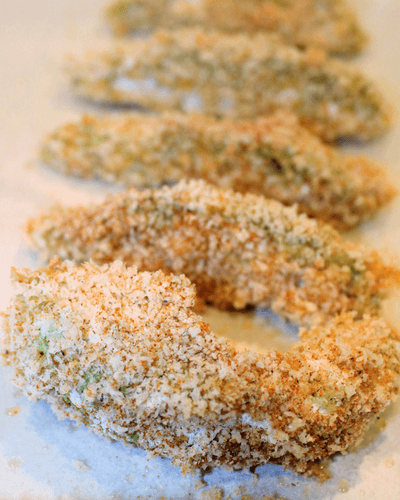 Place the panko covered avocado slices on a parchment paper covered baking sheet, spreading out just a tad. I recommend parchment paper over foil so there is no sticking. Bake avocado slices for 15 minutes and flip them half through cooking. As the avocado bakes, chop your cabbage, a little cilantro, tomato and slice your jalapeno. Make the boom boom sauce. Grab a bowl and add mayo, ketchup, chili sauce and sriracha. Give a good mix. 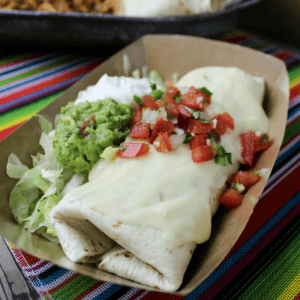 Remove the avocado slices from the oven after the 15 minute cook time and assemble your tacos. Place 2 slices baked avocado on a tortilla, dress up with the cabbage, cilantro, tomatoes and jalapeno slices. Add a bit of boom boom sauce and squeeze fresh lime(optional). Simply Made Recipes is a participant in the Share A Sale Program, an affiliate advertising program designed to provide a means for sites to earn advertising fees by advertising. If you click on an affiliate link and make a purchase, we may receive a small commission. This costs nothing extra to you and helps keep Simply Made Recipes running!